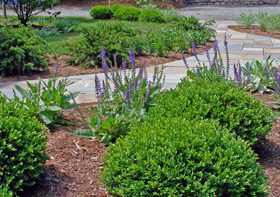 Evergreen shrubs are desirable in the landscape because they stay green throughout the entire year. They do not lose their leaves in the winter as deciduous shrubs do. Evergreen plants can be broad leaf (wide leaves like Rhododendron), or have needle-like foliage. They can be large or small. Many homeowners look for these shrubs for their foundation plantings. And why not? It's nice to have greenery all year long. However, sometimes a particular deciduous shrub can be so striking, that you may want to look away from the fact that it will be bare in the winter. The branching structure does remain, so at least there is some type of form. Consider the sun and shade needed by each evergreen shrub. Many plants don't make it due to not being placed correctly. This is a must. Understand how tall it will eventually get. This is very important also. You don't want it to grow above your windows. At the same time, you might want a tall shrub to soften a blank wall. With a little planning, your landscape can be very maintenance free! Many evergreen plants do well with average soil conditions regarding moisture. However, there are some that prefer wet conditions, while others like it dry. If you know that a particular area is rather dry or wet, you can take advantage of this by choosing a shrub that prefers these conditions. For example, Junipers will do very well in dry soil. If you have an area that you want to do xeriscaping, these plants would be a good choice. Xeriscaping is using plants that are drought tolerant. These types of shrubs can be flowering or non-flowering. An example of a evergreen plant that does not flower (well, it flowers, but they are insignificant) is the Holly...but they have beautiful berries at the end of the season. An example of one that flowers would be a Rhododendron. They flower for a reasonable length of time and will provide color and interest to your garden. Both of these plants like some shade. You should almost always plant in groups of a variety....five Holly or seven Azalea. It is also good design to think about textures. An Azalea looks nice in front of a Holly due to the different size and shape of leaves. Each one will make the other stand out and complement the other plant's features. Don't be afraid to mix in some deciduous shrubs too. There may be some that have wonderful features. In addition, be careful if you have deer. Only use deer resistant varieties. Learn some great tips on how to create a front yard design that will really be unique and special! Confused about front foundation plants? Are you not sure where to place your plants? Do you want some low maintenance colorful perennials? You will find out about all that and more...take a look. Take a look at this ebook which has professional ideas, plant recommendations and pictures. 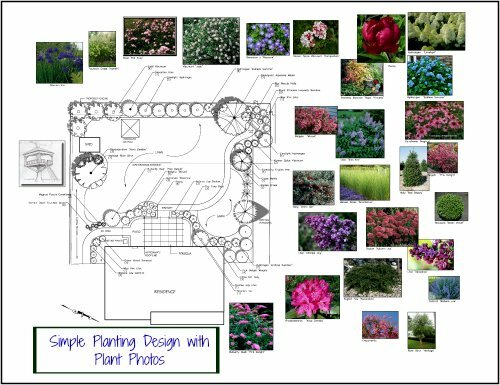 You will find out how to use plants together to create an outstanding design and find out which are the right plants to use for your property.